With GNCC and WORCS races this past weekend, Polaris’ factory racers were out in full force doing what they do best, winning. 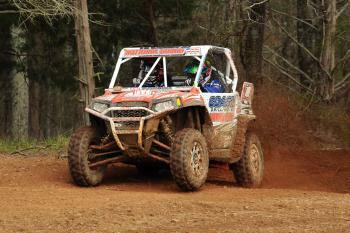 The GNCC UTV race season kicked off in Washington, Georgia and Polaris’ factory sponsored race teams all finished in the top five. National Guard/Polaris/ Coastal/Yoshimura/DragonFire/Yokley Racing Team Driver William Yokley took the checkered flag in his RZR XP 900 in the XC1 Modified Class with National Guard/Polaris/Coastal/Yoshimura/Yokley Racing Team Driver Scott Kiger finishing third. Polaris’ newest sponsored team, Team Hendershot, and their new RZR XP 900 took fourth despite some setbacks and Rath Racing finished fifth. In WORCS, Walker Evans/Polaris Racing’s RJ Anderson was back on top at Round 3, in Lake Havasu City, Arizona. Anderson took the checkered flag in the SxS Production 1000 class with Beau Baron finishing second. RANGER RZRs dominated the class taking the top 13 finishes and Anderson regained the points lead in the series with the win.